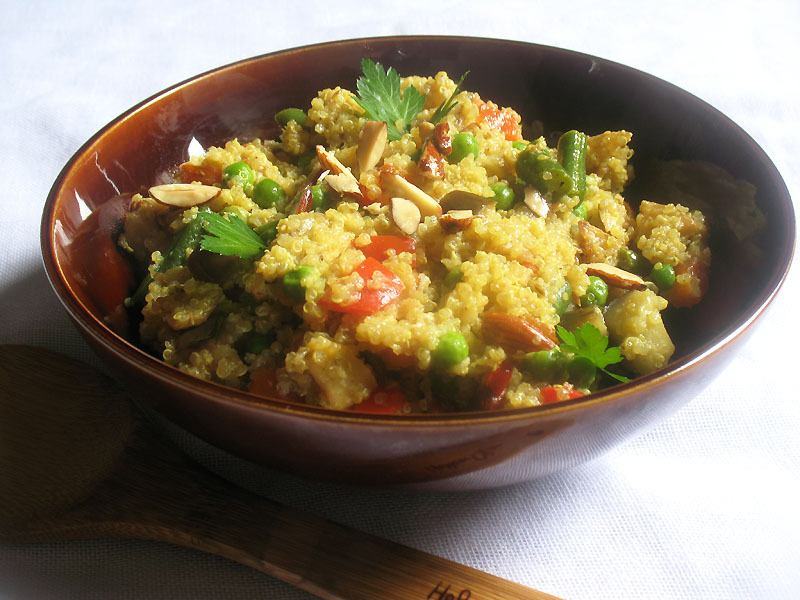 Quinoa is a perfect meal accompaniment just on its own or with a little seasoning, just as rice is. And just like rice, the nutty flavor of quinoa is easy to dress up to take the grain experience to a whole new level. It’s a delicious and simple vehicle for incorporating vegetables into your meal, such as in this colorful, nourishing and filling take on an Indian pilaf. 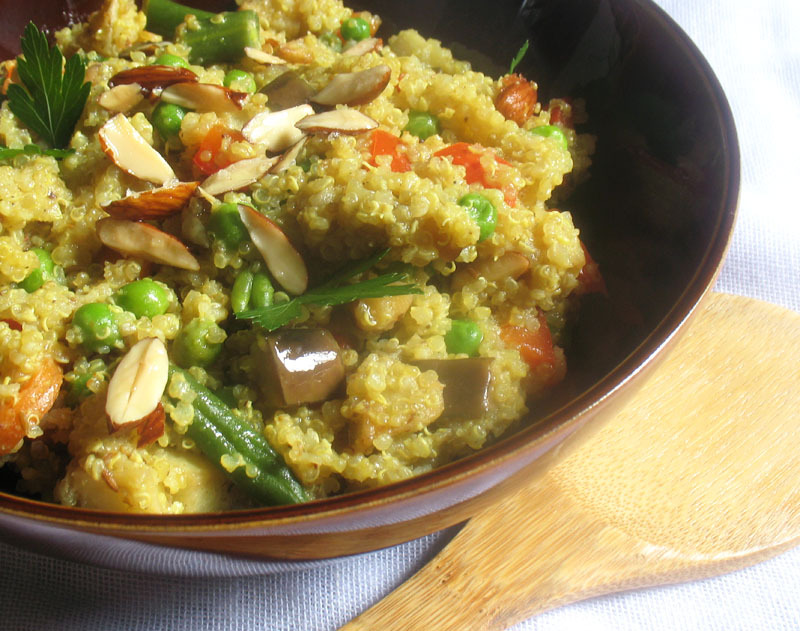 Quinoa is obviously not a traditional Indian grain, but it cooks up just as quickly and easily as the more customary white rice and takes on Indian spices just as well too. 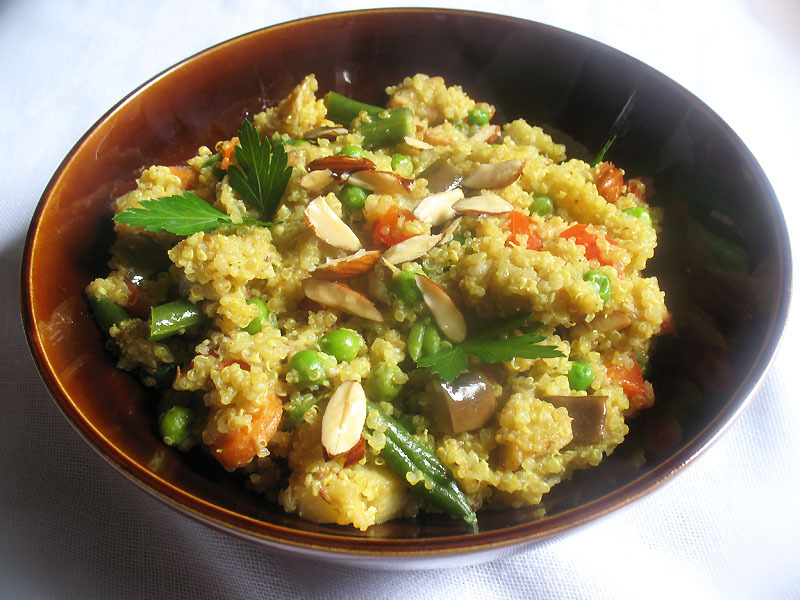 Plenty of fresh vegetables are loaded into this Indian-inspired quinoa dish as well as some almond meal and fried sliced almonds for extra flavor and crunch texture. It’s as good as it looks, if not even better. Each bite is a taste experience. Frying the potatoes before tossing them into the dish prevents them for going mushy. Heat 2 tablespoons of the oil or ghee in a large non-stick saucepan over medium-low heat. When hot, add the almonds and fry, stirring often, until the almonds are browned. Remove with a slotted spoon and set aside. Add another tablespoon of the oil or ghee, turn up the heat to medium-high, and add the potatoes. Cook, stirring often, until they are golden brown on all sides. Remove with a slotted spoon and set aside. Reduce the heat slightly, add the remaining 1/2 tablespoon of oil or ghee, and toss in the cumin seeds. Stir until they darken a few shades. Add the chilies and stir for another minute. Stir in the quinoa, red pepper and eggplant, and fry for another few minutes, again stirring often. Now pour in the water, ground almonds, turmeric, garam masala and salt. Bring to a boil over high heat. Stir in the carrots and green beans and fresh peas if using. Reduce the heat to very low and cover. Simmer for 20 to 25 minutes until the liquid is absorbed. If using frozen peas, quickly add them to the pot about 5 minutes before the end of the cooking time. When all of the liquid is absorbed, turn off the heat and let sit for 5 minutes, covered and undisturbed. Add the almonds and potatoes and gently toss the mixture together with a fork. If desired, toss in a pat of butter.